THE PERFECT TRAINING ACCESSORY FOR ANY SPORT Make Training Easier Looking for a convenient way of distinguishing players while on the field? Then Unlimited Potentials sports pinnies are just what you need! 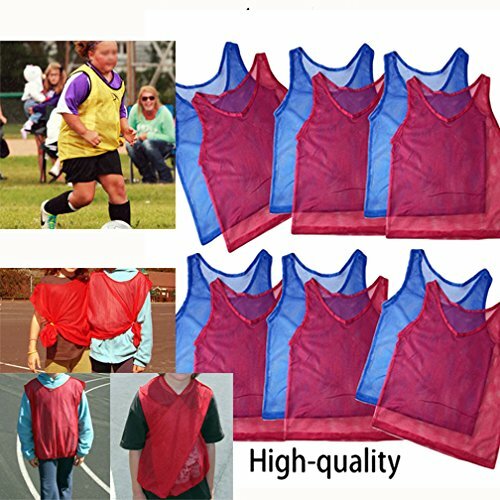 They come in vibrant shades of red and blue, eliminating the confusion of identifying teammates and allowing the coach to easily run multiple drills simultaneously. And it isnt just about performance, these training bibs are pretty comfy too! Weve used breathable mesh to comfortably keep the players cool and skin-friendly polyester to keep irritation at bay. Experience High Quality Dont settle for cheap sports vests that rip on day one; weve designed these training accessories to offer unmatched durability. 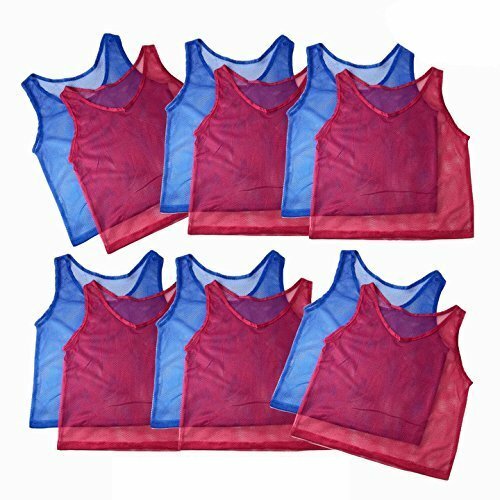 These blue and red nylon mesh pinnies are perfect for any youth sports team, at any level! 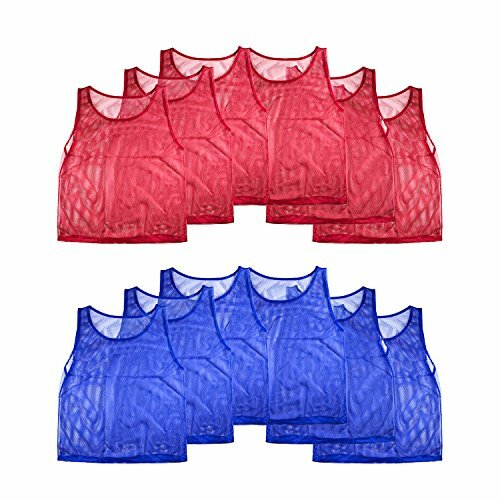 Pinnies jerseys come in a set of 12 (6 blue and 6 red). Can be used in a variety of sports! Perfect for basketball, baseball, football, volleyball, and more. Jerseys fit up to age 12, measures at an approximate 42" inch chest size. 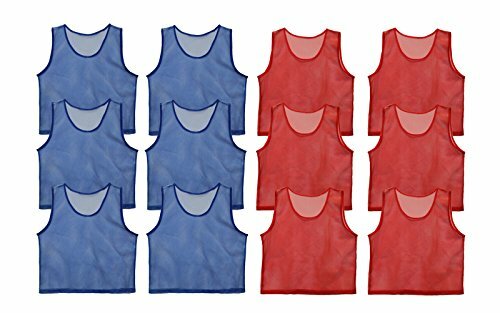 Gear up for the next sports event with the Get Out!TM Set of 12 Scrimmage Vest Pinnies for Youth Sports in Red and Blue. They measure 23 inches in length and 21 inches in width, which is a great fit for children/youth. 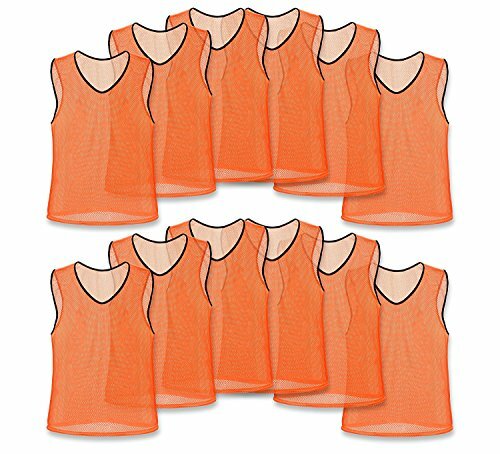 Players can wear these scrimmage pinnies over equipment and clothing, and these nylon mesh vests provide plenty of ventilation. 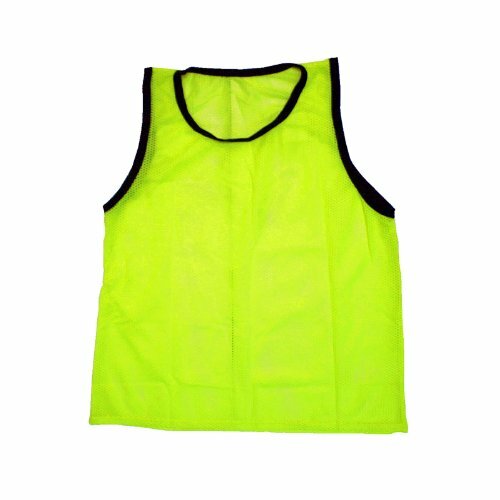 The high-quality material is lightweight but durable to reduce tearing, and this scrimmage vest set features non-abrasive reinforced neck and arm holes for comfort, sturdiness, and ease of removal. 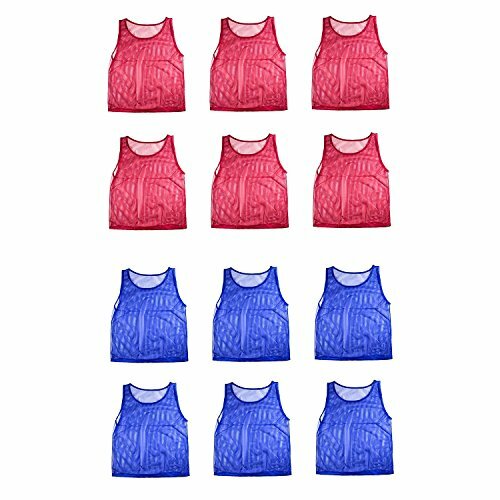 Sold in sets of 12 with red (6) and blue (6) combinations, these pinnies help players easily identify teammates during games, practices, and scrimmages. They also provide a breathable fit that does not interfere with the game. Whether it's for a youth sport league or just a simple competition, these youth mesh practice jerseys will make is easy to distinguish both sides competing. One pack of 12 jerseys comes with 6 red jerseys and 6 blue jerseys. Suitable for kids up to age 12. Measurements: 38" waist / 36" chest / 22" length - 26" shoulder width with 1.75" wide straps - 19" Diameter arm hole. Order these vests and you will be ready for any Sports Scrimmage or Game situation. 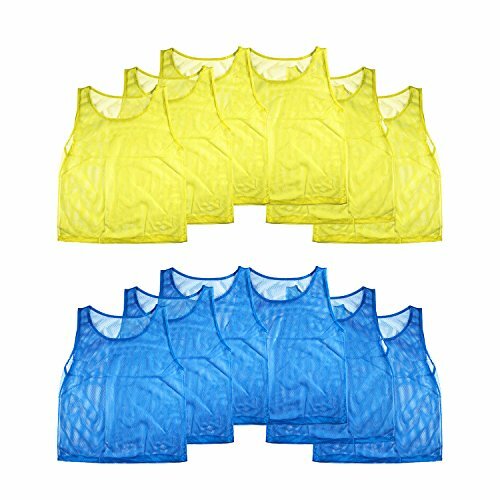 These mesh scrimmage vests are made of very durable Breathable Mesh Polyester fabric and are very lightweight. The colors are very vibrant and will show well on any field. The Orange, Yellow and Green will Glow with UV or Blacklight for Blacklight Events! 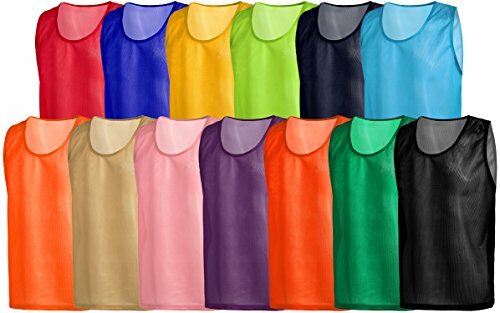 Looking for more Youth Mesh Scrimmage Vest similar ideas? Try to explore these searches: Diesel Exhaust Pipe, Farm Kids Play Rug, and Giant Pineapple. Shopwion.com is the smartest way for comparison shopping: compare prices from most trusted leading online stores for best Youth Mesh Scrimmage Vest, Black Agate Set, Wireless Color Weatherproof Ir Camera, Scrimmage Youth Mesh Vest . 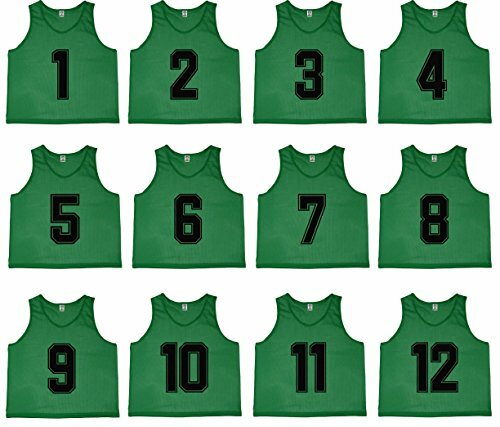 Don't miss this Youth Mesh Scrimmage Vest today, April 22, 2019 deals, updated daily.